In the past three centuries, Ha Tien town in the Mekong Delta province of Kien Giang has been a popular location for tourists attracted to its stunning landscapes and piligrims to Sac Tu Tam Bao Pagoda. Mac Cuu built the pagoda in 1730 with the initial aim of giving his mother a place to spend the rest of her days studying Buddhism. It was renovated in 1930 bringing a curved roof, a lake out front, a flower garden and dormitory for monks and Buddhist nuns. The yard is shaded by many large trees. The pagoda was formerly led by monks but from 1974 nun Thich Nu Nhu Hai was appointed as the pagoda leader and since then it is dedicated to nuns. The pagoda has been renovated many times in recent years. 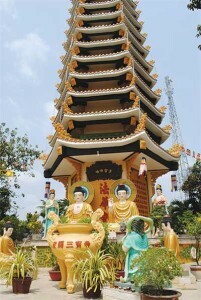 Visiting the pagoda, visitors will witness a large Bodhisattva statue in the yard. There is also a 300-year-old bronze Sakyamuni statue in the sanctum and a large bell donated by Mac Cuu whose mother’s tomb is still located onsite. Many tourists visit the pagoda not only to admire the peaceful atmosphere but also to join in the activities with nuns. The pagoda hosts many programs for youngsters with an aim at providing them soft skills and teaching them a moral and healthy lifestyle.